Originally published by Resilience.org. 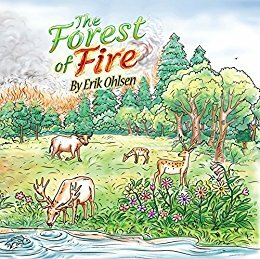 If you haven’t read part one of this article, Raging Wildfires of California Part 1: Destruction through mismanagement, the below ecological discussion may feel out of context. I suggest you read Part 1 to better understand the rest. 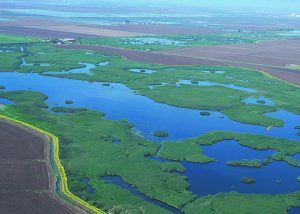 A “regenerative disturbance” is a management regime or natural occurrence that provides a degree of disturbance to an ecosystem that in turn encourages conditions that lead to better health, resilience and regeneration. Multiple regenerative disturbance techniques are introduced in this article. The issues of wildfires, forestry, drought, and climate change are highly complex, and their solutions are just as complex—and highly debatable. These issues are at the nexus of a variety of political, social, cultural and economic challenges in our communities. The opportunity is to build bridges across these cultural divides – to unify historically opposing groups towards common goals and solve some of these problems as a result. Nobody wants to see their own or someone else’s home burn to the ground. Nobody wants to see a person’s livelihood decimated. Nobody wants to see wildlife and forest ecosystems destroyed. Whether you’re a forester, an environmentalist, an indigenous community member, a firefighter, a homeowner or a government official, these are places where we have common ground. There are real solutions being modeled out there and we need to remove the political obstacles and financial shackles that keep them from being implemented at the scale that will provide real benefit to people and planet. It is vital to understand that every ecosystem on earth has its own unique set of circumstances, issues, and management needs. Any solutions we talk about here or elsewhere may be appropriate in some areas and inappropriate in others. And because of the inherent complexity, it’s not enough to solely focus on the physical needs of an ecosystem, but it is just as important to look at the economic, social, and political will as well. We are not going to agree about all of these things but hopefully we can at least try for the sake of our communities and our ecosystems to take serious action on solutions that care for both. To be clear, I’m not a professional forester or firefighter. Rather, I’m a professional ecological land manager who’s been practicing land stewardship for nearly 20 years in forest management, watershed restoration, pastoral restoration, and landscape development. I’ve worked alongside professional foresters, certified rangeland managers, and indigenous land managers. Years ago, I had the honor of taking training’s from Dennis Martinez, an indigenous land manager and the chairman of Indigenous peoples restoration network. Organizations like IPRN are vital for leading us in the right management direction of our landscapes. The integration of indigenous wisdom for the modern day crisis, and bridging Traditional Ecological Knowledge (TEK) with Western science is key to unlocking solutions moving forward as Dennis writes so eloquently on their website. To be clear, Dennis and Indigenous Peoples Restoration Network have not endorsed this article. I am highlighting them as an important resource for this discussion. Many First Nation communities in the United States sustained extremely long cycles of ecological health for themselves and the ecosystems they were maintaining. We need to harness the wisdom of indigenous communities who managed California and U.S. landscapes for tens of thousands of years with prescribed burning and other forgotten methods. No Western civilization has any chance of achieving this with our current land management practices as we’ve destroyed much of our ecology in just 150 years and counting. We must immediately shift our practices of land management towards ecological place-based appropriate management techniques with a timescale managing health for multiple generations into the future. Prescribed burning is the practice of intentionally setting low intensity fires in the forest to consume and reduce the accumulated fuel load of dead limbs, thatch and out-competed smaller trees. The timing, technique, and location are thoroughly assessed for optimal effect and mitigation of catastrophic consequences. These burns are often carried out in spring when plants are still green and humidity is present in the ecosystem to ensure the fire cannot spread into the canopy of established trees and people managing the prescribed burn can keep it controlled. There’s no way I could do justice in describing this ancient practice here. To learn more, watch the video Catching Fire, which I just saw after posting my original article. I have intentionally avoided using the term “sustainable thinning” in this article. Much of what is shared here does fall into that category, but that term may have been co-opted by the logging industry in the past to open up harvesting of old-growth trees. From an ecological perspective thinning trees to provide a more open canopy, less fuel load, and more light to the forest floor, if done right, provides a host of benefits for the forest, wildlife, and human communities that live there. When we talk about fuel load management through ecological thinning I’m not talking about large-scale commercial logging activity, although logging companies may be some of the best situated to provide ecologically based thinning practices in our forests. Nor am I advocating for clear cuts or cutting old-growth trees in any way shape or form. Instead, I am advocating for a systems-level view of forest health. A healthy forest does not feature only mature or only young trees. Rather, it will have a succession of different-aged trees to provide a multi-generational outlook of the forest so it can live for tens of thousands if not millions of years into the future if that is appropriate to a place. This view can be controversial and both those in the logging industry or communities affect by logging will likely have strong feelings about “thinning.” When we talk about thinning a forest in an ecological way we are talking about removing second and third growth trees, and dead and diseased trees that were never removed from the system early on due to fire suppression lack of large animal disturbances and regenerative human driven management practices. In many cases our forests have become congested with hundreds or thousands of stems per acre. This creates a host of ecological problems such disease, lack of diversity, erosion, soil acidification and the threat of catastrophic fires. To manage a forest with ecological thinning practices takes a very informed view of what trees to remove and to leave. In many cases forests are so congested that they have become fuel load nightmares. Fire ladders are now in such abundance that if a fire came into such a congested forest it may quickly become a crown fire, swiftly escalating to the kind of catastrophes that are seen throughout California and other parts of the world right now. So what is a healthy forest? A healthy forest is one that has fewer stems per acre and where there’s more space in between the trees. The question of how many stems per acre depend on the species of trees, the climate, and many other factors. The best place to learn what is the right balance for a place is to work with the indigenous communities of that place who have tracked these forests for tens of thousands of years. 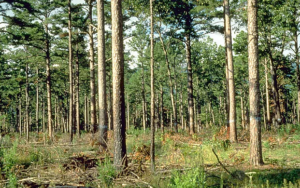 An ecologically thinned forest (fewer stems per acre, balance of different ages of trees) also has the benefit of increased light on the forest floor and an increase of air. Airflow helps reduce disease and parasites from establishing themselves in the forest. Just as houses with poor ventilation can be subject to mold, the same goes for forests. In keeping the forest light, not congested and in a healthy balance we allow for a reduction of potential disease and pathogens. Many of our forests today are severely infested with either pathogens or parasitic insects as a result of forests that are too dense. Ecologically based forest products as a result of thinning may provide a small-scale economic solution to some of the financial obstacles to making this work happen. Entrepreneurial thinkers made be able to make small-scale businesses selling furniture, tools, soil building products, mushrooms, sustainability harvested building materials and other potential value added products that come from ecological management of the forest. As described in part one of this article, large animals have played an important management role in our ecosystems for millions of years. Extensive hunting and industrialization have wiped out many of these important species in our ecosystem. Grazing ungulates like elk and antelope stomp accumulated and dead organic matter (fuel load) into the ground where it can come into contact with soil-level moisture and microorganisms that will cause it to further decompose. Other animals like bears have always been important forest managers as they break down the low branches and small trees in the forest as they scavenge for food. As a result, material that would otherwise volatilize and release greenhouse gases into the atmosphere—namely, CO2—instead builds organic matter and stores carbon in the soil. Elk and antelope never “overgrazed” areas because they were followed by wolves, coyotes, and mountain lions that kept these hooved animal herds bunched up and on the move. This predator-prey relationship results in a beautiful and dynamic ecosystem management pattern that has been lost in our contemporary ecosystems. Putting all debates around humans eating animals aside for now, if we specifically look at the activities of well-managed animals in the right environment and the impact it has on an ecosystem we can easily see that from an ecological point of view integrating animals (even domestic) into land management may have huge benefits if managed appropriately. 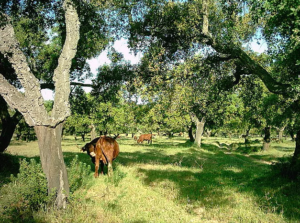 Models like the Dehesa systems in Spain and Portugal have been incredibly effective in regenerating devastated landscapes while being economically and ecologically sound and managed over many generations. Another benefit of using ruminants to manage landscapes is that in the dry season the guts of these animals actually provide the bacterial decomposition function of the ecology. Therefore as they eat down grasses, forbs, leaves and branches they are actually decomposing that material in their guts whereas in the middle of summer many temperate ecosystems don’t have the moisture level to decomposes material any other way. To be realistic, it’s unlikely that we will see a huge resurgence of elk and antelope in the California environment in the near future. So, in the near-term, we may need to utilize domestic animals to provide some of the same functions and management regimes as these amazing animals once did. Pigs, goats, cow and sheep could all play important roles on public and private lands in managing fuel load and getting carbon into the ground. The realities of such endeavors will have to be specific to each site and carefully monitored by the community for optimum ecological health. There will be plenty cases where the use of domestic animals in managing our ecosystems may not be appropriate either from social or economic issues or cultural and ecological ones. In all cases success depends on understanding the specific needs of an ecosystem and community to decide on the best practices for that place. The Holistic Management model provides a great framework for decision-making in this regard. It’s important that we look at the solutions to these issues through a systemic lens. If we manage our fuel load ecologically, and look at this material as something beneficial rather than “waste” then we have an opportunity to not only mitigate destructive fire but also address drought at the same time. When it comes to managing carbon, we get to create a scenario where the benefits of the whole are greater than the sum of the parts. A forest is made of many tons of carbonaceous material. Forests and pastures are magical in their ability to pull carbon dioxide out of the atmosphere and transfer it into matter, creating a carbon sink for long-term storage. The matter the carbon is getting locked into is of course in the roots, trunks, branches and leaves. It’s important to understand how these ecological processes relate to climate change. On smaller scales, we can actually manage this material without burning it which enables us to halt carbon from escaping into the atmosphere altogether. By accelerating decomposition instead of burning material, we not only avoid the risks posed by fire but we can build topsoil as a result. Adding carbon to the soil also increases the soil’s ability to absorb and hold water. In this way, we can think of soil as a carbon and water battery or storage device. An improved capacity to absorb and hold water in soil means that there’s more humidity in the landscape, supporting more productive land and protecting against catastrophic wildfires and drought. At the home scale, we need to look at woody material as an abundant source for a variety of potential functions: edible mushrooms, soil building, mulch, basketry material, craft wood, erosion control material, and more. This is a great example of moving from just restoration towards regeneration and must be the new standard for how we manage landscapes. Humans have been such a destructive force on ecosystems for the last 150 years that it’s not enough to just restore ecosystems, we have to regenerate the ecological functions and processes of our environment in order for future generations to live on a healthy planet, we need to increase biological and ecological productivity for the sake of the earth itself. 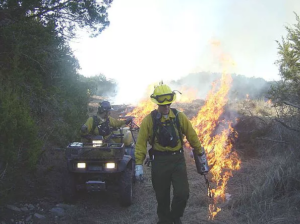 Prescribed burns have an important role in managing the fuel load of multi-acre ecosystems. But if at all possible, not burning fuel load material and either chipping, inoculating with fungi, or strategically burying it on contour can all provide opportunities where we vastly increase topsoil and soil’s ability to absorb storm water as part of our efforts to sequester carbon and mitigate drought. Below are a few methodologies for doing just that. In other parts of the world Biochar has been used as a way to sequester carbon and build topsoil for agriculture productivity for millennia. Biochar may offer huge potential in combination with prescribed burning. This is an exciting innovation to combine these ancient management practices to manage fuel load while sequestering carbon, building topsoil and retaining water. In simple terms a burn pile (often utilized in prescribed burning) can be created in such a way to tightly stack logs and light the top rather than the bottom of the pile. A pile like this burns off the least amount of carbon while still burning the rest of the fuel load of that material. What’s left is a kind of charcoal where the carbon is so strongly bonded to the material that it takes hundreds of years to release into the atmosphere. Once this material comes in contact with microbes it becomes a highly sought after host for beneficial microorganisms. Used to amend soil to boost fertility, support the living biology in the soil, and improve water retention, this method has amazing potential. In a strategic way we may be able to create large amounts of biochar and manage forest fuel load at the same time. Biochar is already an accepted and marketable soil amendment throughout the world. Erosion has its own devastating effect on our ecosystems and relates to the mismanagement of our forests. Part of the devastation we experience, especially throughout Northern California and the Pacific Northwest, is erosion due to old badly graded logging roads. The way many logging roads convey water can vastly increase erosion in a watershed. Often this results in huge and deep gullies that continually destabilize parts of the forest and carry sediment into local streams and watersheds. We can use some of our fuel load management techniques and ecological thinning practices by taking woody debris and literally using it to pack large erosion gullies. It’s important when packing a gully to ensure that the organic material has direct contact with the earth at the bottom of the gully and that any winter moisture and fungal activity can wick into the material and sustain through the entire pile of debris. This helps reduce the fire danger in the area as the more moisture and fungi amongst and inside this debris will make it less likely to burn. If there is great concern for fire you can also blow chips over the top of the systems and further increase the ability for this material to absorb water and stay moist. This is very effective in stopping erosion, and over time the gullies actually fill back up with sediment. The water slows down when it hits all the brush inside the gullies and the sediment carried by the water actually deposits and fills up the eroded area again over time. The flow and velocity of water, the size of the gully, and other factors may or may not make this approach appropriate. Again, solutions need to be matched to place. The erosion issue we see with logging roads is generally because of the way that the surface of the road is graded to slope into the hillside (in-sloping) with large ditches and culverts used to convey this runoff water away from roads into surrounding environments. In some cases if we are unable to re-grade roads to slope away from the hillside (out-sloping) and pull out culverts or utilize other beneficial road management techniques, we will have areas where there are high volumes of water moving through drainage’s and gullies unnaturally. Where appropriate, we can take large logs and brush (again utilizing nearby fuel load material) and actually “key” (trench the ends into both banks) them into the banks of these unnatural drainage’s. Once we’ve keyed them in we can place perpendicularly across the drainage with logs and brush material to make a permeable dam. This will slow down water during storms and deposit sediment behind the check dams to help in repairing the erosion gully. These brush check dams are permeable, meaning water is able to slowly pass through the material thus slow the water that would otherwise erode the banks to get around a non-permeable dam. At the center of these check dams are low points so that in large storm events overflow water pours down the middle and does not try to erode the sides where logs are keyed into the bank. This technique is only to be used in non-named, non-mapped unnatural eroded drainage ways. These drainage ways are not to be confused with natural creeks, streams and waterways where these sorts of systems may or may not be beneficial and permits would be required. To increase the ability of this water to stay around in the dry season, carbonaceous woody debris material (again, what would otherwise be fuel load) can be used to pack water retention structures placed in the landscape. Water retention structures can be a contour ditch, seasonal pool or rain garden and are ideally placed to capture surface runoff from roads or other structures. Again, the material must have ground contact and not be sticking up above the natural grade to avoid adding to fire danger. We can even inoculate these systems with desirable and beneficial fungi in order to yield edible mushroom crops and aid in decomposition where pollution is not present. Keep an eye out for my new article titled “From Drought to Deluge” in the near future to learn in detail about mitigating drought and harvesting water. If the aesthetics of a system like this are of concern we can always cover the woody debris with wood chips or other material so that you do not see the debris; often, they just look like pathways. This material breaks down fairly quickly over a few years. As it breaks down, it builds topsoil in the surrounding area and provides for extra moisture absorption acting like a huge sponge for trees and shrubs planted in or near these systems to utilize. As was discussed in Part 1 of this article, the amount of money spent to suppress fire and handle emergencies and rebuild infrastructure is astronomical. If governments and communities could act to fund fuel load management and ecosystem management techniques as part of mitigating disaster it’s very likely that we can avoid the catastrophic fires currently threatening California. The mechanics of how this actually plays out is beyond my scope of knowledge and understanding. What I do know is that historically opposing groups need to come together to pressure decision-makers under unified banners to make funding for these management needs happen. How do we integrate the management needs of the forest with creative and innovative ecological product production? As you can see, on the small and in some cases large scales there are so many potential opportunities for turning fuel load material into a variety of benefits including building topsoil, catching and storing storm water, growing fungi, yielding sustainability harvested wood products, feeding animals, and regenerating harvestable vegetation. Once a forest gains more light to the forest floor due to ecological management, there is a resurgence of herbaceous vegetation. This creates an opportunity for harvesting medicinal and edible wild crafted plants that, if done in an appropriate and ecologically sensitive way, could provide another small-scale ecologically sound economic benefit. As a permaculturist, I’ve been trained to design systems in nature’s image. One of our great goals is to design human settlements in such a way that they mimic all the patterns of a natural ecosystem. This can be a different way to look at caring for our environment, because we care for people and earth symbiotically as part of our ethical intent rather than separating human needs from natures. We see humans as an integral part of the ecosystem and therefore an integral part of its regeneration. A permaculture design process looks at the beneficial role humans can play in their ecosystems and searches out innovative and creative relationships between people and their environment. In nearly 20 years of design and practicing this work, I can tell you humans have an innate and incredible ability to heal ecosystems and can at the same time have potential to create social and economic resiliency. Can we have our forest and eat it too? I believe we can, but it’s going to take a multi-stakeholder and multi generational effort. These are tough questions to ask but are also among the most important and urgent in our time. The greatest challenge is in ingrained mindsets that have grown up over the last couple of hundred years and all of the emotional and social battles that have taken place, either from the genocide of indigenous people, the battles between loggers and environmentalists or the mis-prioritization of public money in land management. How do we build bridges across these various mindsets? How do we put aside the differences of old-school environmentalism, forest management, indigenous wisdom, economic development, and political will? We need to focus on unifying the needs of humanity and the needs of ecology. This is the only way we will possibly be able to make it through the climate crisis and all that it brings: wildfires, drought, floods and economic destruction. It’s not enough to say that humans are the blight of this earth, and if we weren’t here everything would be okay. We need to utilize the ingenuity and creativity of the human mind for the regeneration of this planet. It’s also not enough to say we should just let the logging industry have their way and harvest our forests to oblivion. So how do we translate these sentiments into action? There are many of you out there who have much better solutions than I can ever come up with. I hope you folks weigh in on the conversation, and do it with an open mind and heart. We need to pressure the state and federal governments to be more innovative in how they utilize their funding in ecosystem management. Ecological land management is a great endeavor and it’s clear we can create thousands if not millions of jobs in this country managing our landscapes ecologically. The potential yield would be immense both for ecosystem processes, economic production, and disaster mitigation. We desperately need to look to indigenous communities for guidance and action. If we want a way out of this mess then it’s time to put the colonialist mindset aside and embrace the deep and generational wisdom of our indigenous communities. 50,000 + years of relationship to this land is more acute, more aware, and more able to assess solutions to these issues than the colonial mindset of the last few hundred years ever will be. Maybe, if we have real intention in healing our landscapes we will also get an opportunity to heal cultural wounds at the same time. Maybe these “natural” disasters are our wake-up call, not only in ecological management needs but also in cultural healing; to develop an ecological based economic system and a more unified way forward. I’m ready to make it happen. Are you? Aerial view of a forest fire in Saskatchewan (2009). 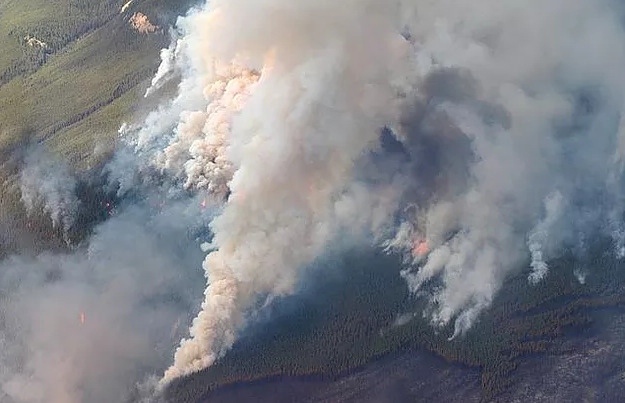 “During the first week of June 2009, Sustainable Resource Alberta burned nearly 8,000 hectares of forest in Western Alberta, just east of the Saskatchewan River Crossing on the Icefields Parkway and Highway 11. The forest was destroyed to bring about greater diversity, stem the spread of mountain pine beetle and to create a fire barrier for any future wild fires.” Photographer: Cameron Strandberg from Rocky Mountain House, Alberta, Canada. Via Wikimedia Commons. Firemen doing a prescribed burn. U.S. Fish and Wildlife Service. Via Wikimedia Commons. Pinus echinata forest after thinning and light prescribed burn. Ouachita National Forest, LeFlore county, Oklahoma, USA. Author: Robert F. Wittwer, Oklahoma State University. Via Wikimedia Commons. Imagen de una Dehesa en Bollullos Par del Condado (Huelva). Via Wikimedia Commons.